It's summer and Californians are at the beach. Surfers and swimmers are enjoying all the classic spots glorified in Beach Boys songs. What's up at the beaches besides the famous waves? Well, the battle to keep the beach and water plastic free is hot as the late afternoon sand. We congratulate the LA City Council for taking a stand against plastic pollution and making Los Angeles the largest city in the nation to ban plastic bags and charge for paper, driving a transition to the most sustainable alternative, reusable bags. This measure will inspire a shift in mindset from our addiction to single-use convenience to conscious thinking about simple lifestyle changes individuals can make to improve our communities and the environment. Plastic Pollution Coalition, a global alliance founded in California, is working hard to spread the message of reducing single use plastics to people around the globe, most recently at a conference on solutions called Think Beyond Plastic and at Bonnaroo music festival where the group worked with artists and the festival to reduce plastic consumption. Country-Punk LA based band Nocona teamed with PPC to share ways to reduce personal consumption of single use plastics during their show on the Rock the Earth curated Solar stage. The band, featuring 5 Gyres board member Elan Glasser on harmonica, showed the crowd how to hydrate responsibly with reusable water bottles. 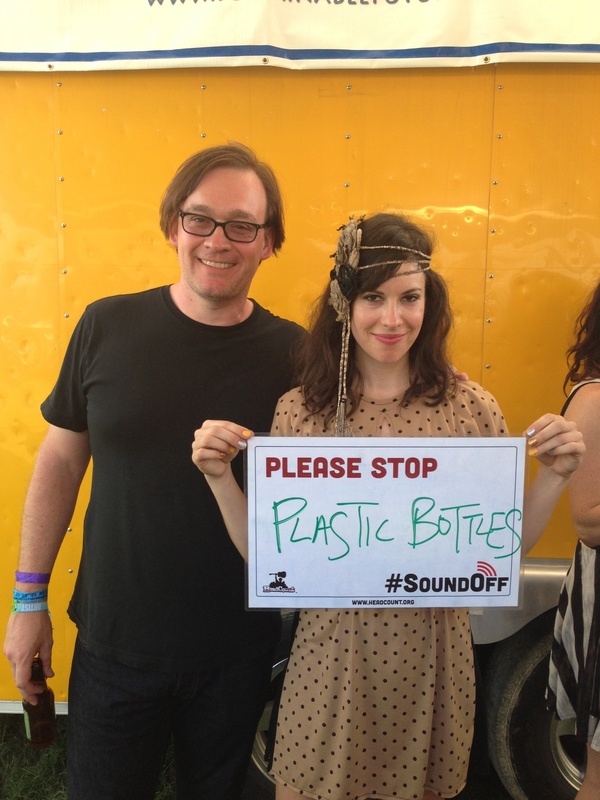 After the show, members of the band posed with a sign that read "Please Stop Plastic Bottles." The Bonnaroo venue, on a large Tennessee farm owned by the concert producers, has well water hydration stations strategically placed for concert-goers to refill their reusable water containers for free. In California's Palm Springs, The Coachella Music Festival 2013 had free filtered water available for refilling and a demonstration called The Oasis by Global Inheritance of tap water and even filtered, reclaimed waste water that tested and tasted as clean as any mountain spring. Really. I tried it. Los Angeles-based We Tap is behind a smartphone application to locate public water fountains in California. Their mission is to help people locate good, fresh water on-the-go for refillable bottles or a quick drink, instead of relying on plastic packaged water. Though we applaud this move, The 5 Gyres Institute along with core campaign partners The Plastic Soup Foundation, Plastic Free Seas, and a coalition of nearly 100 NGOs worldwide believe this phase-out timeline is far too long. We have made demands with other manufacturers that all beads be removed by no later than January 1st, 2015 and wrote a letter to this effect that went unanswered by Mr. Schlatter. 5 Gyres is leading a campaign to get this giant global corporation to remove plastic micro-beads from its products worldwide by 1/1/2015. You may add your name to the campaign here. Los Angeles-based sports television personality Angela Sun is on a national tour of film fests with her excellent documentary Plastic Paradise about the "Great Pacific Garbage Patch" a collection of plastic waste in the Pacific Ocean 1000 miles off the California coast. 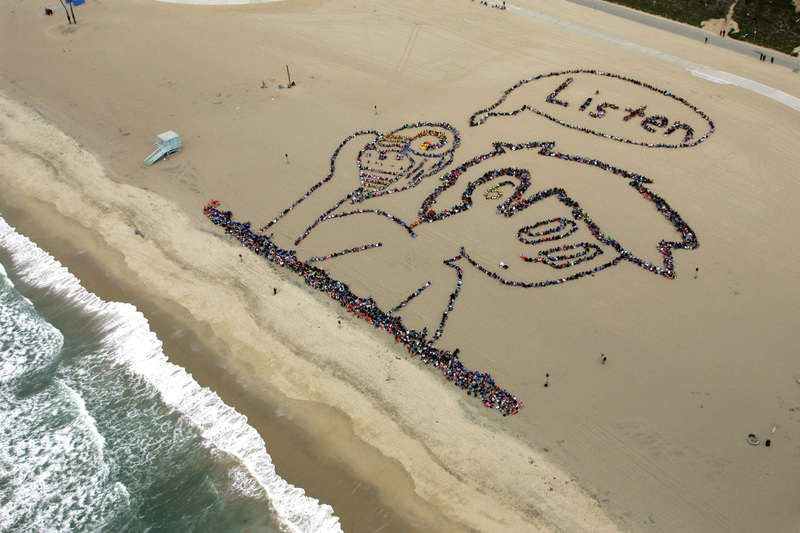 And more than 3,500 kids in Los Angeles took a stand in the sand against plastic pollution on the 20th anniversary of Kids Ocean Day in Los Angeles, forming a message with their bodies on the beach asking for us to LISTEN to the ocean and stop polluting it with our plastic trash. Similar Kids Ocean Day events were held in San Francisco and San Diego.